Last week I ate a whole pig's worth of free pork. HA! Actually, I DID do that after Husband, Ryan, Justin and I drove 10 hours in our pick-up truck to the World Pork Expo in Des Moines, Iowa, with a trailer full of pigs. To start from the beginning of our adventures, check out the thong-a-riffic World Pork Expo - Day 1 and poop-filled World Pork Expo - Day 2. 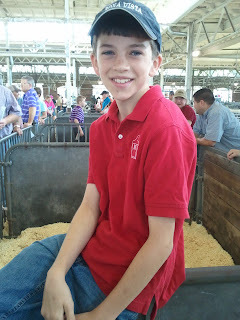 World Pork Expo Day 3 was also Ryan's 11th birthday. He happily celebrated the day like he will many birthdays, with manure on his boots and a smile on his face. The year he was born my father-in-law headed to the World Pork Expo on his own so that Husband could stay close by. Fortunately, Ryan waited to arrive until his GrandDad got back. Oh, my! Look at this hot mama ready for the morning's pig show, also I was there. In my day I was quite the pig shower swine exhibitor. (I was NOT a pig shower. I was a pig show-er.) 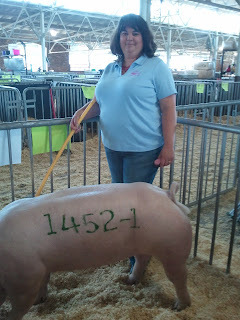 Actually one of the first times Husband let me show his pigs at a national show, I focused my efforts not on the judge but an official who was on the side of the show ring, and I STILL beat him. But more recently have I ceded hog showing duties to the kids and focused on being the chief photographer and brush and spray bottle carrier. But since we had four pigs in the same class and four of us, I was pressed into duty. You may find this surprising but Husband did NOT give me the best one of the bunch. I ended up in 12th place but Husband and the boys placed near the top and their pigs all made the auction--which was the goal of this show. I was excited to be breaking in my RodeoBaby Rocker Square Toe boots from Country Outfitter. 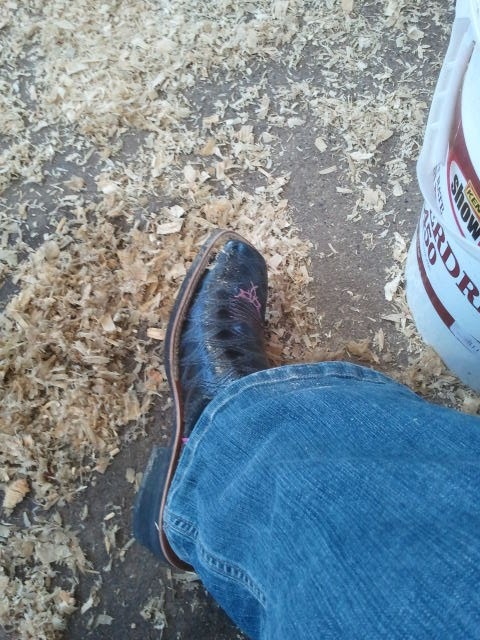 I had reviewed them late last year but this was my first chance to try them out in show conditions. And they did quite well. My feet were so comfortable that I wore them all day and even that afternoon when I left the state--more on that later. After doing well in the day's hog show, we were especially proud to see the boys earning recognition for their skills as hog judges. Justin's novice team won first place in the judging contest while Ryan's won third. 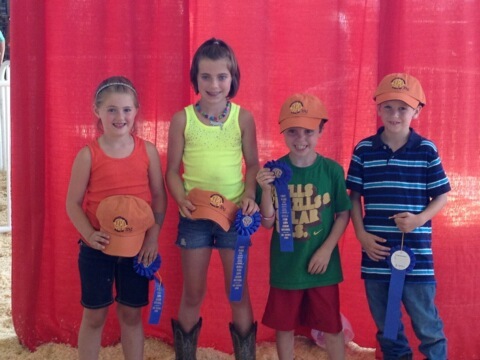 Justin went on to be one of the top 10 all-around exhibitors in his 8 and under age group--beating at least 100 kids. 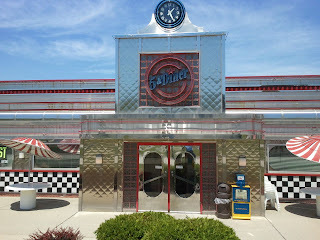 That night while I snuck across state lines to hang out with a friend in the burbs, Husband and the boys had a birthday dinner at Ryan's favorite Des Moines restaurant, 5 & Diner. UPDATE: I have one more quick story to share about life in the hog barn. I was sitting in a chair by our hog pens when I noticed a guy digging through the trash. I immediately thought some down on his luck guy was looking for cans but knew that he was more likely to find pig sh*t. He dug for a while and then he turned around and I saw he was eating a piece of jerky. That he got from the trash? He saw me staring at him. Turns out he was a fellow pig farmer who explained that he had dropped his truck keys in the trash and that he had the jerky in his other had while he fished for the keys. Whew. The only thing that wore me out more than Day 3 was WRITING about Day 3. I'll save my adventures journeying west across Iowa in a covered mini-van for Day 4.